We stray from Moog recordings for this edition of the blog to document some of the early pioneers of live Moog Modular performance. While digging through many of the clippings, news blurbs, and press releases associated with Bob Moog and his synthesizer, I sometimes find stories about the use of the early Moog Modular in concert. Ive been gathering these cases for a long time and offer them here for the Moog record. Most of these instances fall into the time period 1965-1970. They capture the use of the Moog Modular at its creative summit, prior to the widespread availability of the Minimoog. The idea that the Moog Modular synthesizer could be used in a live performance is somewhat contrary to what people believe today. Yes, it was a complicated instrument and it sometimes behaved unpredictably, especially in its tuning. But the Moog Modular was also viewed as a remarkable combination of many audio devices with enormous potential. The available variations in patching and playing were essentially infinite. Without further delay, I give you a partial record of early Moog Modular live performances, organized chronologically. By no means do I consider this record to be completeadditional listings and suggestions are welcomed. 1967 – John Cage presented Solo for Voice 2 (1960), with Carol Plantamuras voice processed in real time using a Moog Modular. This was a piece composed for various instrumental settings in 1960, but this Moog performance was in 1967. 1967 – LaMonte Young, Drift Studies, live performances using Moog Modular oscillator modules. This work was for two or more sine wave drones played at frequencies prescribed by Young. Aware that the tuning of these oscillators would drift over time, he created a piece that made use of this phenomenon. This was the basic strategy for a series of works that he and partner Marian Zazeela produced into the 1970s. First performed at their Church Street loft in lower Manhattan in 1967, Young also lists several gallery installations including the Robert C. Scull Commission (1967); Claes and Patty Oldenburg Commission (1967); Betty Freeman Commission (1967). The work is still performed at Young and Zazeelas Dream House, but they no longer use the Moog modules. 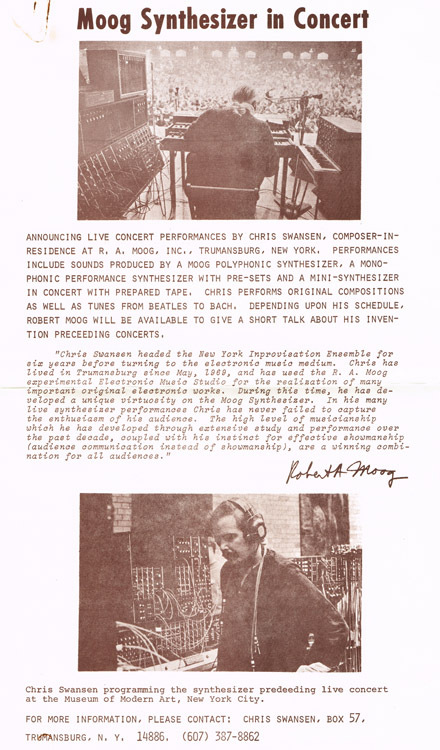 May 15, 1967 – Donald Erb premieres Reconnaissance using two Moog synthesizers played in real-time with a chamber orchestra; Robert Moog operated the synthesizers at this Music In Our Time series performance, New York.2 It was performed again on October 4, 1967 in Los Angeles and at Expo ’67 in Montreal.3 The piece was one of the first chamber orchestra works composed for synthesizer. Interestingly, it used one prototype Moog Polyphonic Electronic Instrument and one Moog Synthesizer. 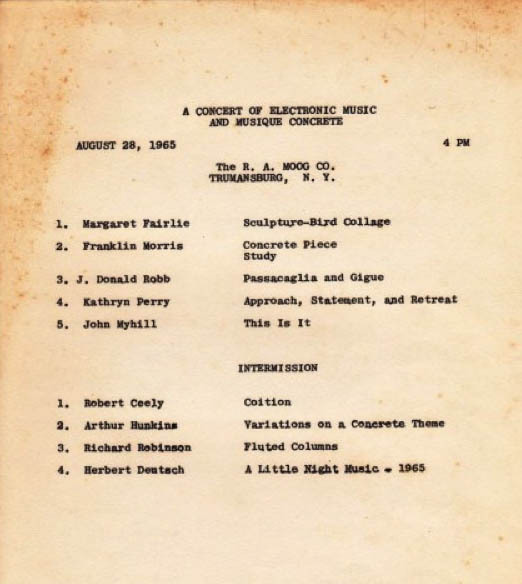 May 10, 1968 – Gershon Kingsley premiered Shabbat 68 for Today at the Temple Sharey Tifilo in East Orange, New Jersey, for live Moog, cantor, mixed choir, organ, percussion, guitar, and bass. March 1969 – Leonard Bernstein Young People’s Concert received a lot of press at the time, which is why Im including it. But the Moog was on tape, not live. They played different versions of music by Bach. 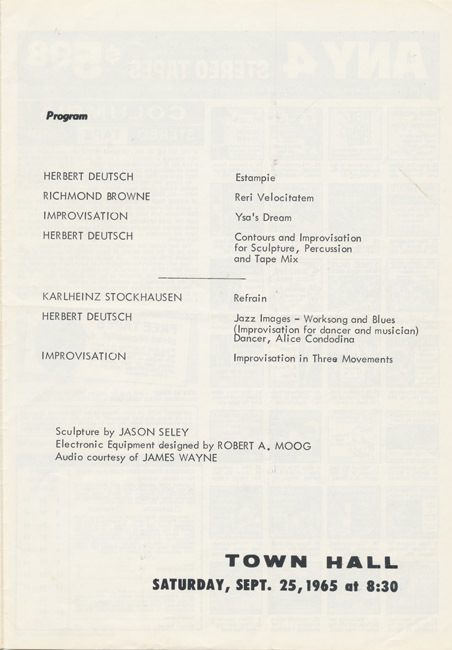 Bernstein described the program as, Its Bach switched-on, turned-on, rocked, rolled, shaken and baked.5 The program featured a recording of Wendy Carlos Switched-on Bach (only three months after its release) and interpretations of Bach by Lukas Foss and the New York Rock and Roll Ensemble. This important broadcast brought the word Moog into households across North America. March 22, 1969 – John Mills-Cockells Moog was played live at a rock concert on March 22, 1969 at Torontos Rockpile festival, where the group Kensington Market premiered the newly recorded songs from its forthcoming album, Aardvark. This is one of the earliest live appearances of Moog Modular for a rock concert. June 14, 1969 – Party Day, National Arts Centre, Ottawa, Ontario, Canada, with music provided by John Mills Cockell using the Moog Modular synthesizer. Photograph by Peter Moore. Photographic Archive. The Museum of Modern Art Archives, New York. Swansen was long associated with Moog Music, taking the synthesizer on the road from 1969 to 1977. He was part resident composer and musician, technical advisor, and tour guide for Moog. 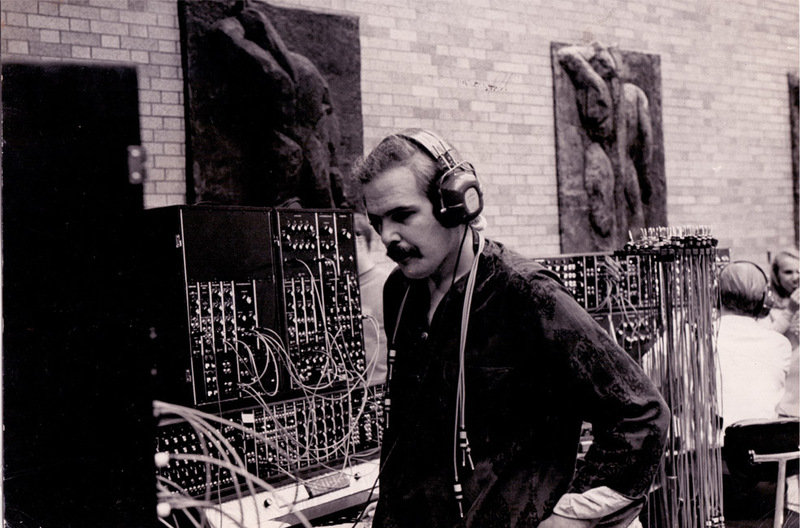 Over time, he may have put together more live performances of Moog synthesizers than any other individual. In 1972, he was described as the Musical Director of the Experimental Music Studio at R. A. Moog Inc. I know of at least 24 performances given across the country, from Briar Cliff College in Iowa, to Traverse City High School in Michigan, and dates from New Jersey to Texas, Florida to New Mexico. 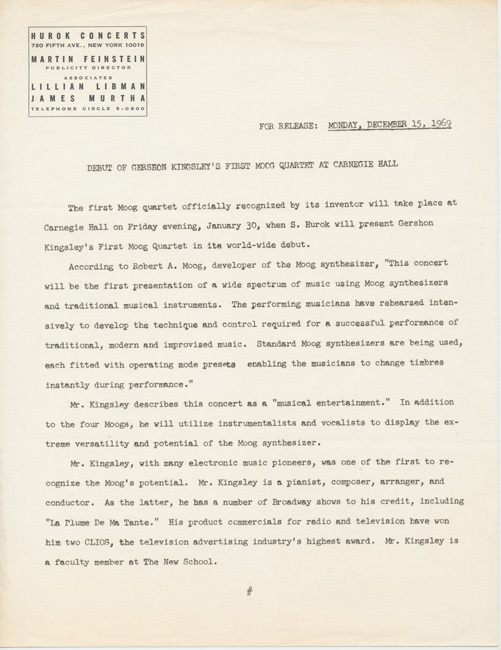 Many of these were combined demonstrations and concerts, often done by himself. But for some of the performances, Chris was joined by his trio members, Don Crocker (polyphonic synthesizer), Jon Weiss (mixing and modulation), and Swansen on monophonic Moog. His selections included everything from Bach, Lennon-McCartney, Simon and Garfunkel, Blood Sweat and Tears plus his own compositions. August 31, 1969 – At Family Dog on the Great Highway, San Francisco. It was a rock club alternative to the Fillmore West, hosting many bands in the Summer of 1969 at this small venue. A group called S. F. Radical Lab’s Moog Synthesizer played on this night. September 19-21, 1969 – S. F. Radical Lab’s Moog Synthesizer and Doug McKechnie and His Moog Synthesizer at the Family Dog on the Great Highway, San Francisco. November 8, 1969 – Paul Bley and Annette Peacock and others performed live at Town Hall with Moog Modular. Paul Bley played some Moog keyboard while Peacock was modulating her singing voice through the Moog. The music included arrangements of classical and popular selections plus some original music. 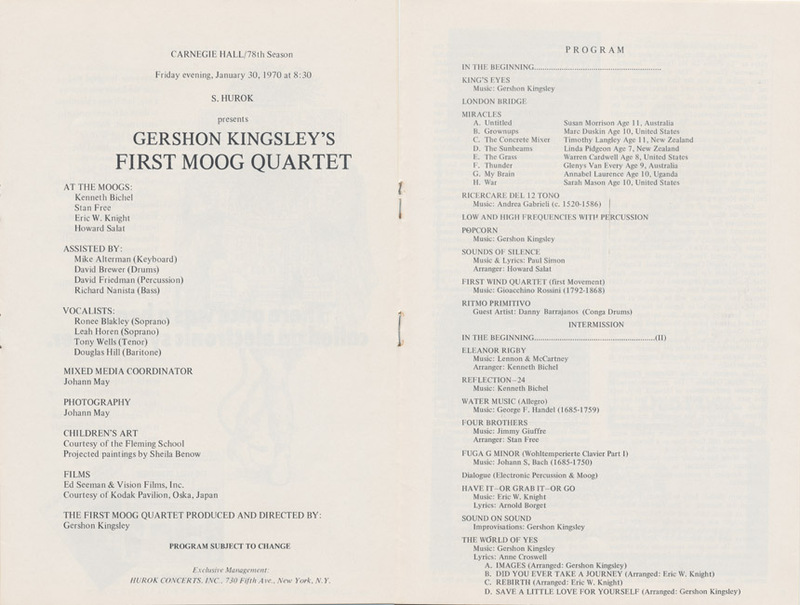 Known for being a keen arranger, Kingsley’s program included Moog sounds plus various instrumentalists and vocalists. 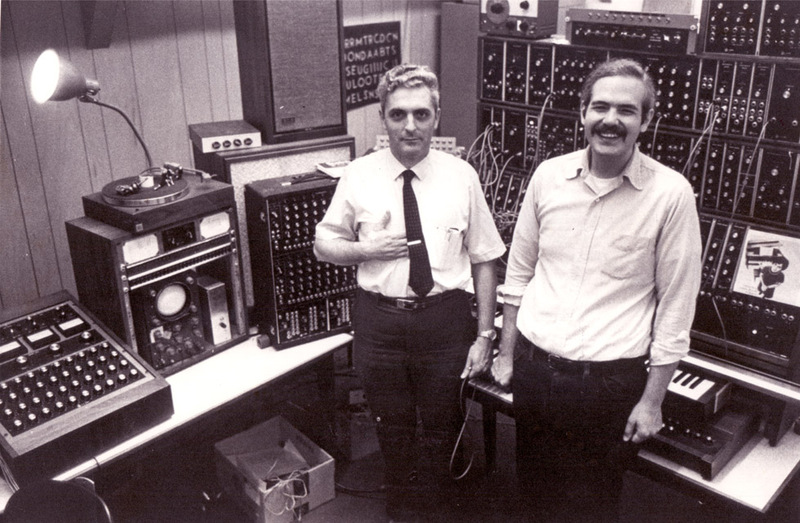 Kingsleys group consisted of himself, Stan Free, Eric B. Knight, and Ken Bichel, all playing portable models of the Moog Modular. Auditioning musicians for the gig was a monumental task and reportedly involved listening to 150 musicians. A tour of universities and symphonies followed Carnegie Hall and included concerts with the Boston Pops and Arthur Fiedler (and premier of Concerto Moogo, August 23, 1970); McAfee Gymnasium in Charleston, IL (January 28, 1971); Temple Music Fair, Ambler, PA (June 28, 1971); Clowes Hall, Indianapolis, IN (October 20, 1971); Eastman Theatre, Rochester, NY (April 6, 1972); Memorial Hall, Chapel Hill, NC (April 2, 1973); plus other dates that I know of with symphonies in Miami, Detroit, Munich, and Cologne. February 19, 1970 – Gershon Kingsley, with his Moog Modular, performed at the Shabbat service performance at Temple Shearith Israel in Ridgefield, CT. Mrs. Herbert Deutsch was superintendent of the school, a discussion followed the service. March 17, 1970 – Mike Vickers (who taught the Beatles how to use the Moog) played Berliozs Symphonie Fantastique at Royal Festival Hall, London. He was joined by Keith Emerson and Nice, who played Tchaikovskys Pathetique Symphony, although this was a pre-Emerson, Lake, and Palmer Moog performance. 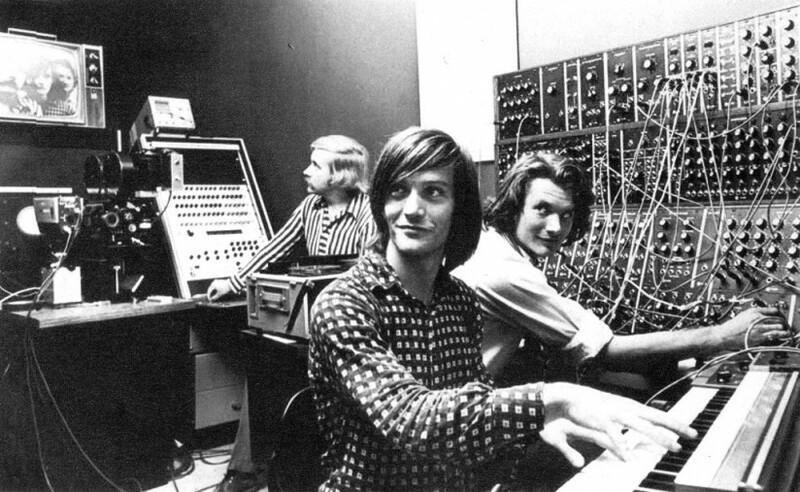 Vickers managed the patching and control of the Moog while Emerson played. 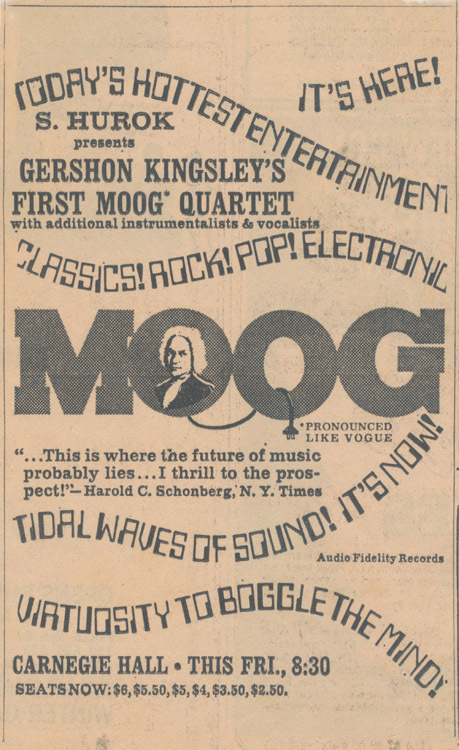 March 28, 1970 – Gershon Kingsley, Shabbat for Today live Moog performance, plus guitar, bass, drums. Temple Israel, Royal Oak, MI. 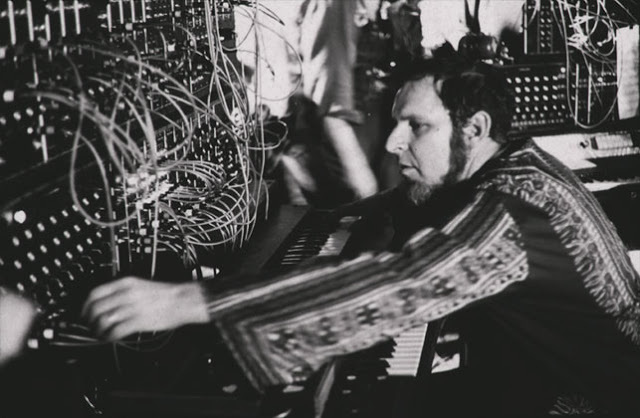 April 8, 1970 – Merrill Ellis, “playing the Moog synthesizer,” for a live performance of the pieces, Kaleidoscope, and Mutations. Tucson International Music Festival. Well, weve had no throwing of vegetables, said Ellis. He used one of the new Moog Modular models in a travel case, a model 1P.10 The electronic music studio he established at the University of North Texas housed a Moog Modular 1C with modifications that was given the name of E-11 by Bob Moog in recognition of Ellis. 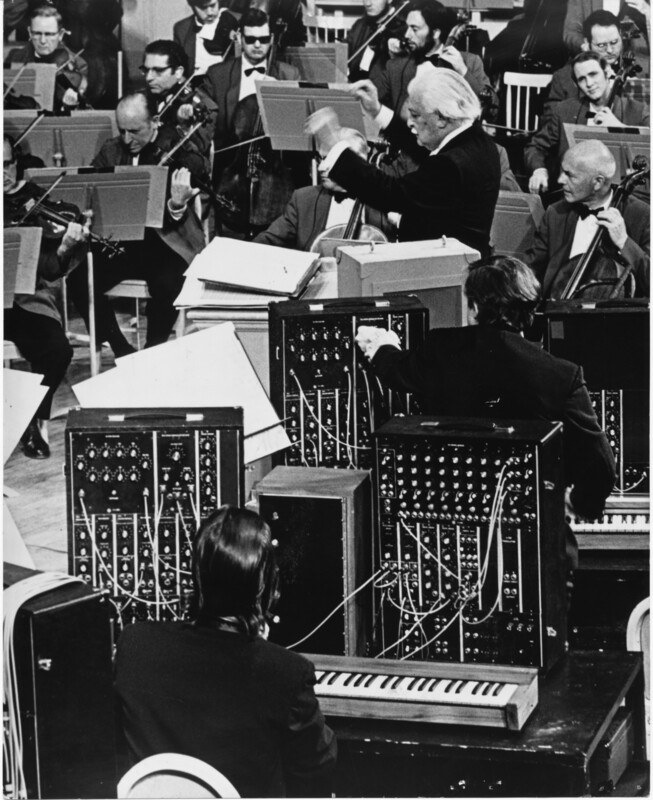 The First Moog Quartet (with Kingsley closest to the orchestra), performing “Concerto Moogo” with the Boston Pops Symphony. May 15-16, 1970 – Doug McKechnie and His Moog Synthesizer at the Family Dog on the Great Highway, San Francisco. 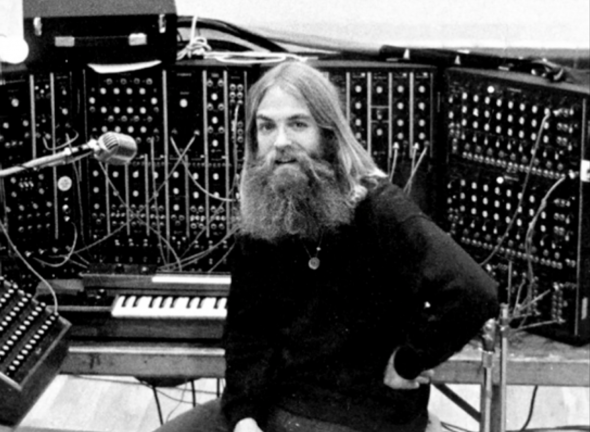 August 8, 1970 – John Mills-Cockell played a restaurant gig in Toronto with his Moog Modular and sax player Doug Pringle. The restaurant was called, Meat and Potatoes. August 12-16, 1970 – Bley and Peacock expanded their synthesizer arsenal to include the ARP. In August 1970, they were booked to play the Jazz Workshop for a week in Boston. August 29, 1970 – Emerson, Lake, and Palmer Isle of Wight Festival. This might have been Emersons second live performance with a Moog. This historic appearance took place on the fourth day (Saturday) of the five-day event and showcased Emersons magnificent Moog Modular. More than 600,000 people attended the festival. It was the UK version of Woodstock and was influential for its number and variety of musical acts, ranging from country, Brazilian, rock, folk and a host of upcoming British acts. September 5, 1970 – Sausalito Art Center Festival. Different Fur Trading Company gave a recital with their Moog and other musicians on piano, flute, harpsichord, and sax. Names associated with this included Frank Albright, Margaret Fabrizio, Patrick Gleeson, John Payne, John Vieira. Photo by David Sieg, 1971. 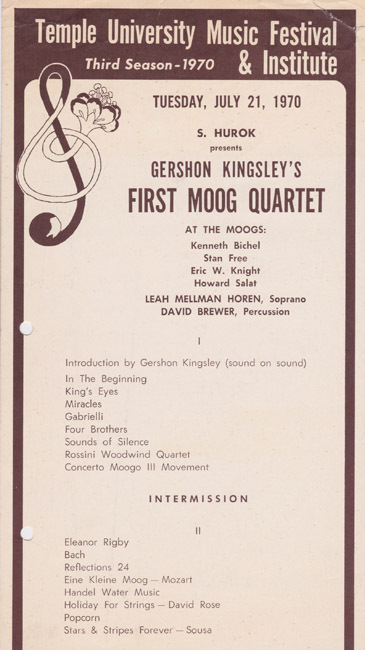 September 26, 1970 – Gershon Kingsley and First Moog Quartet with Chicago Symphony Orchestra at Orchestra Hall. November 1970 – Paul Bley acquired an ARP synthesizer and Annette Peacock continued to keep the Moog modules to modify her vocals. They took this configuration on an eventful tour of Europe in November of 1970. They traveled widely with bookings that included clubs, radio, television, and festival appearances in Amsterdam, Frankfurt, Munich. Berlin, Hanover, Amsterdam, and the United Kingdom.18 During these events, Bley and Peacock would perform but also explain the workings of the synthesizers. November 20, 1970 – Merrill Ellis. At Baylor University School of Music, concert pieces for Moog modular at the annual Festival of 20th-Century Music, Waco, Texas. Holland.. Annette Peacock. Using an ARP, no mention of Moog. December 9, 1970 – Emerson, Lake and Palmer perform Pictures at an Exhibition at the Lyceum Theatre, London. 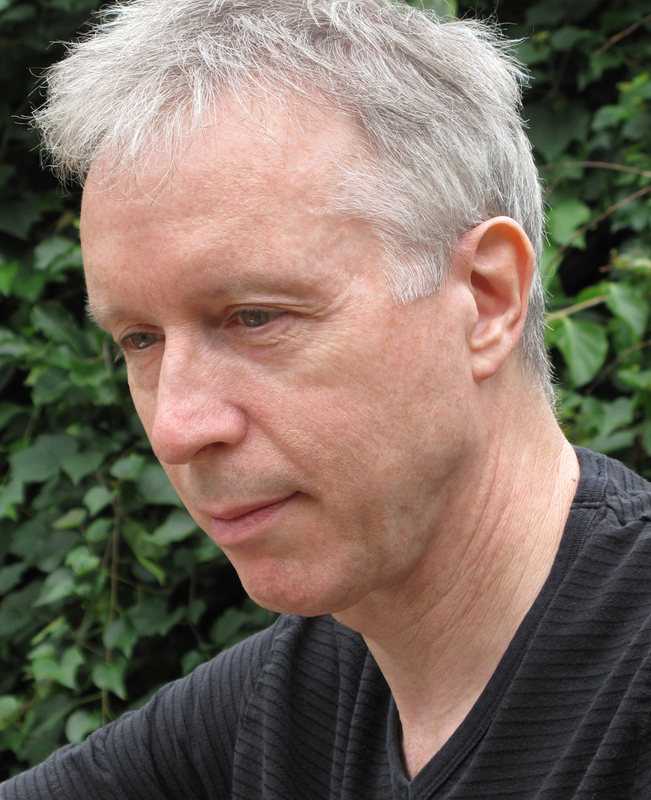 Thom Holmes is a music historian and composer specializing in the history of electronic music and recordings. He is the author of the textbook, Electronic and Experimental Music (fourth edition, Routledge 2012) and writes the blog, Noise and Notations. For his ongoing project, The Sound of Moog, he is archiving every known early recording of the Moog Modular Synthesizer. Billboard, may 20, 1967, p. 49. Liner notes, MUSICA ELETTRONICA VIVA, MEV 40 (19672007) 80675-2 (4CDs). © 2008 Anthology of Recorded Music, Inc. and New World Records. Price, Theodore. Switch it On, Mix it UpIts Bach. Akron Beacon Journal, March 30, 1969, 141. The Nashville Tennessean, Sunday, December 14, 1969, 16E. 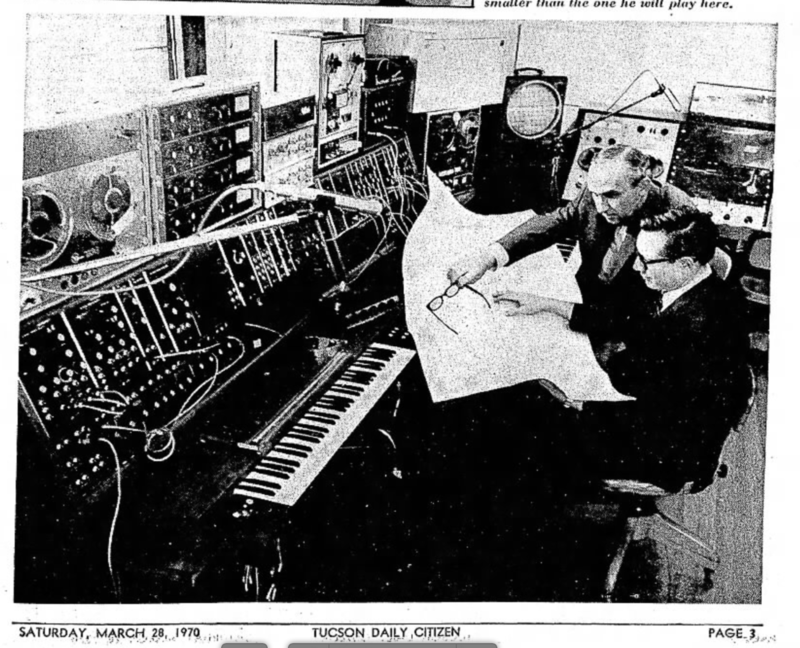 Tucson Daily Citizen, Tucson, Arizona, Saturday, March 28, 1970, 31. The Times, San Mateo, California, Tuesday, April 21, 1970, 19. The News Journal, Wilmington, Delaware, Tuesday, April 14, 1970, 23. Red Bluff Daily News, Red Bluff, California, Tuesday, August 18, 1970, 3. Democrat and Chronicle, Rochester, New York, Sunday, August 2, 1970, 96. Raymond Ericson, New York Times News Service as seen in The Pocono Record, Stroudsburg, Pennsylvania, Thursday, October 15, 1970, 7. Raymond Ericson, New York Times News Service as seen in the Caller-Times, Corpus Christi, Texas, Sunday, October 18, 1970, 28. Waukesha Daily Freeman, Waukesha, Wisconsin, Saturday, October 3, 1970, 5. Billboard, 82.47 (Nov 21, 1970): 84. Somewhere around 1970 (perhaps earlier) I attended a concert in Century City, CA (Los Angeles) where Mort Garson set up his modular on an outdoor stage and played a concert. I believe he was miming the entire performance which was on tape. I requested a visit to his studio for a tour of the instrument (I was about 16 at the time) to which he agreed. He gave me about 15 minutes and kicked me out. Imagine my surprise when that very system went up for sale in the local classifieds. I have been its proud caretaker since the ’80s. When Bob autographed it for me, he said he believed it to be the first system delivered to Los Angeles. However  The Nice (and Yes) played two shows at The Festival Hall on February 7 1970, with Emerson playing Mike Vickers’ Moog. The concert was reviewed by Richard Green in the New Musical Express dated February 14. As far as I can see, this was Emerson’s first use of the Moog live, and according to the article at least, the Moog’s “first time on a British stage”.